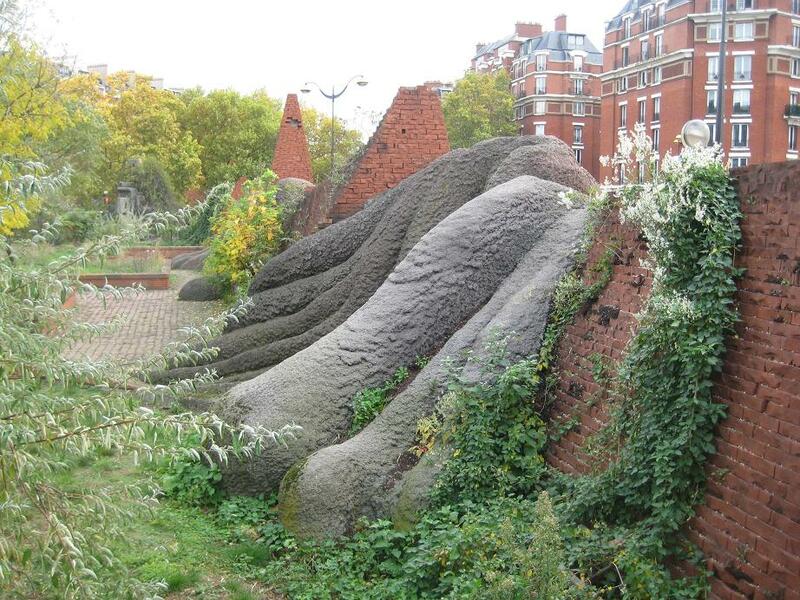 The ugliest sculpture in Paris? I'm a self-proclaimed fan of brick, but I have never really been convinced by its usage in public art. A good example of the reason why can be seen with Pierre Sabatier's wall of lava next to the Porte de Champerret. The installation is not without merit. The juxtaposition of forms and textures are interesting, and there is a certain organic feel to the piece - especially now that nature has clamped itself onto the creation - but the ensemble to my eyes is ugly almost to the point of repulsiveness. Perhaps it is unfair to class the creation as a sculpture at all. It was placed here in the early 1970s, and was part of an urban regeneration project that also included the covering over of the périphérique and the construction of an underground exhibition centre. 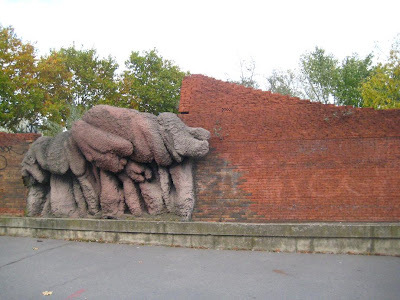 It is a fully-functional wall, marking the outer limit of a small park (more a kind of scrubby urban plot that attracts only city outcasts), but it is impossible to overlook the sculptural aspect of the piece. But just what are these strange forms? Sitting alongside the Square de l'Amerique latine, the wall is apparently supposed to represent the Andes mountain range, with its peaks, depressions and volcanic flows. An interesting idea, but one that seems to have born poorly executed. Perhaps though it is simply a creation that has come to the end of its life-span. The lava flow certainly looks today like a cast off from a low budget science-fiction filmset, and the brick wall is in a very sorry state. At certain points chunks of brick are missing, but the biggest crime against the material is that several different colours have been used in the various repair jobs performed over the years. Diluted tags and grafitti have left traces across the surface, and even the lava seems to have been put in the wash with something of a clashing colour. 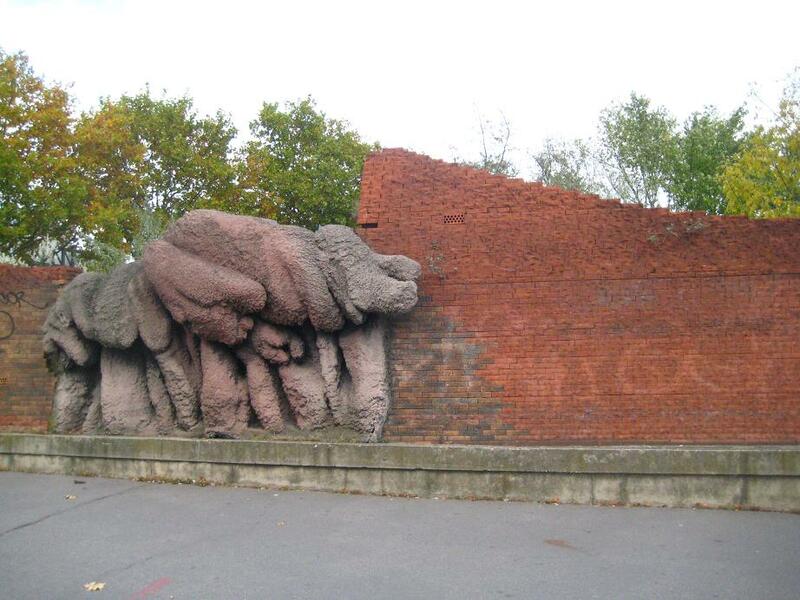 Can the artist be blamed for the condition of his creation 40 years after its installation? I find it difficult to believe that it was ever attractive, but it certainly could have been looked after better. I think it unlikely that it will get a second chance, but I imagine that few people would mourn its passing if it was replaced in its turn by another urban regeneration project. wow this is weird , totally the paris version of the movie blob. PS LIKE UR BLOG. I'm trying to figure this whole blog thing out myself. i'll follow u if u follow me. I was reminded of elephants looking at this, not sure why. It's interesting, but it looks like a cancerous growth to me, so I'd be tempted to blast it with radiation. I usually vote to keep anything that was originally considered "art" but I would make an exception with this installation. I'm with you in that I cannot imagine that it was ever a pleasing sight. Paris has embraced a variety of art and art-forms but she missed the mark on this one. Great post, however, and it may be a memorial years in the future as I am sure that not many have taken the time to photograph this "art." I wonder if there's color photos of this from around the time it was first installed? Anonymous - perhaps I should clarify the term. The wall here is situated on the extreme city limits, in part of a ring around Paris which was once known as the 'zone'. It was a lawless area where those who could not find a place to live in the city tended to congregate. These are the outcasts. Does seem dated. Wonder what people thought back in the 70s. Not beautiful in the conventional sense, but I find it interesting. 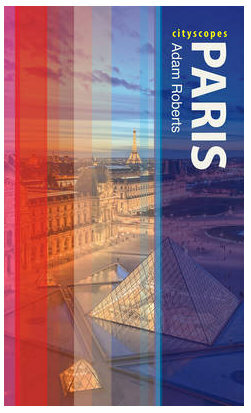 I like how Paris is open to all kinds of art...not the case in my area of the US. Hi. What a splendid blog: I just found it via the Guardian recommendation. You have a great eye for the interesting and more unusual parts of the city. As a fellow Brit in Paris, I have learnt about several new places I'd like to visit from your site, including the Jardin d'Agronomie Tropicale in Vincennes, which to my shame I have never heard of. I shall add your blog as a link from mine (which covers much more mainstream sites and would love to be as quirky as yours), and will be back. Actually, I too got the impression, that the first photo were of elephants!! In a place like Paris - I agree this can be named as the most disgusting installation. Who got this idea and where is art in this ?!? Well..where the beauty is, the devil is too !! 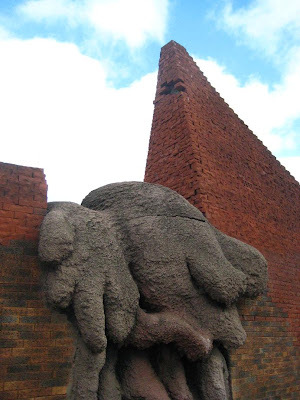 I went back to this 'sculpture' this week and investigated it a bit more closely. I think I've done it a disservice in some respects. The usage of several different colours of bricks is deliberate, but most interestingly of all, each brick has been chipped and carved in an effort to make the normally flat surface resemble a mountain face more closely. That said, the wall is still pig ugly to look at! Your blog is such an interesting read, especially for a former tourist turned resident. Glad I found it par hasard; hope you don't mind if I link to your blog. As for the wall: they say true art is polarizing, so I guess the blob has succeeded in at least that.